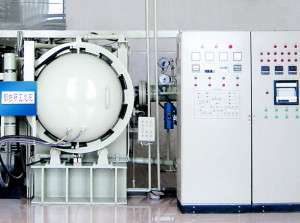 Compared to low pressure carburizing and gas carburizing, not only can be formed without oxide and the surface of the pollutants, and combine carburizing and quenching, improve the part deformation behavior, improve the carburizing temperature, reduce the time of the batch processing, greatly reduces the gas and energy consumption, at the same time, prevent the formation of the carbon black. Low pressure vacuum carburizing is an improved gas carburizing process, carburizing is far lower than the atmospheric pressure, when the typical pressure range is 300 ~ 300 pa. Its advantage is that the steel surface keep very clean, because without the mutual reaction of the gas, vacuum carbon faster to reach the surface of the steel. Carburizing hydroxyl type of gas is introduced when carburizing chamber, cracking produced activated carbon atoms, they are free to penetrate the surface of the steel, and a by-product of residual hydrocarbon and hydrogen were ruled out the vacuum pump system. At present, we adopt vacuum carburizing hydroxyl type of gas is acetylene (C2H2) and propane (C3H8). In the low pressure vacuum carburizing, hydroxyl class gas cracking reaction is balance, means that the steel surface can quickly achieve the carbon in the austenite saturation level. Through repeat one strong permeability and diffusion process, access to hope to get the carbon distribution and layer depth. Low pressure vacuum carburizing process control is based on the theory of diffusion of the carbon content of austenite saturation value control act “, namely the whole carburizing process is composed of several carburizing process set, every carburizing process including strong permeability and diffusion in two stages. To determine the number of each child carburizing process and each stage carburizing process including strong permeability, diffusion time need according to the composition of the material requirements and thick of carburized layer and the surface carbon concentration, a mathematical model to determine, for computer calculation.